Hi, I am interested in your 1972 Chevrolet Corvette (stock #4716-ATL) listed on Autotrader for $25,995. I'd like to get more information about this vehicle and confirm its availability. Heres a classic thats sure to catch your eye. 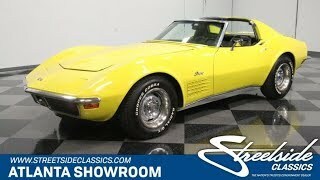 This 1972 Chevrolet Corvette wears a vibrant exterior shade to make it stand out in any crowd and it still carries its original powerplant under the hood. The running condition here is very strong, so theres absolutely nothing to keep you from firing it up and hitting the road just as soon as you get it home. Bright yellow paint coupled with this Chevys sleek form is a winning combination - quite a number of Corvettes from this era were decked out in this color. The paint is in very solid shape, with a nice shine that injects plenty of vitality into an iconic ride that already started out with more than its share of it. The chrome brightwork and collection of emblems are very strong and really pop against their striking background. The third generation of the model, of which this fine specimen is a proud member, brought with it a very attractive and functional T-top configuration. It was a big hit from the start and for good reason, as it offers the ability to go from exhilarating open-air motoring to a more sheltered hard top experience in just a couple of steps and the body colored panels that are included look good and seal very nicely. As a 72, this Vette is among the last specimens of the model to roll off the line with chrome bumpers at both ends and it represents the styling cue in very good fashion. A clean rear luggage rack and factory-style wheels that have been kept free of curb rash add even more to the appearance of this American classic. The interior was refurbished in black vinyl while retaining a great factory-correct look. The pair of high-backed buckets inside show very little sign of wear as they loom over new black carpeting while straddling a solid center console whose signature incline puts the manual shifter within easy reach of the driver. Farther forward, the dash is in very nice shape, with factory gauges still occupying its instrument cluster and the original AM/FM radio holding its position in good working order. While the Corvettes vintage design takes the rear trunk out of the equation, the storage compartment behind the seats does a nice job of making up for it - theres a surprising amount of room back there to accommodate luggage or whatever you choose to bring along on weekend getaways. Beneath the hood sits the original 350 cubic inch V8, running strong with its 4-barrel Rochester carb on top and looking very sharp in its chrome valve covers and chrome air cleaner, both of which wear 350 emblems to call out the powerplants displacement. The engine sits in a nice tidy compartment, surrounded by fresh hoses and neatly routed wires and pairs with a 4-speed manual transmission to provide just the right hands on driving experience for a vintage American sports car like this. An aluminum radiator has been added up front to help keep temperatures in check, while the aftermarket HEI ignition maximizes available spark. Despite coming along at a time when disc brakes werent considered standard even up front, theyre at all four corners here to bring the set of 15 Rally wheels with their BF Goodrich T/A radials to prompt, fade-resistant stops. Below, the undercarriage looks very solid and from that vantage point youll be able to check out another innovation Chevy lavished upon the model: its independent rear suspension that helps equip it with both excellent cornering ability and a skip-free ride over uneven surfaces. This 1972 Chevrolet Corvette is a bright, appealing classic that holds the promise of plenty of fun-filled miles ahead. Call today!